Posted by Wairimu in food, What's cooking? I’m not actually Catholic, but my hubby is and when he decided to give up meat, I gladly did the supportive girlfriend thing and gave up meat too! It is something of a challenge for a typical Kikuyu man, who eats meat with everything. but to my surprise he has managed quite well! I mean if Jesus could go 40 days with no food or water (might need to check that in the Bible), then a guy from Nyeri can go without meat! So 20 something days in to this lent thing and I have eaten enough vegetable dishes! though I realised, restaurants in Nairobi don’t really cater much for vegetarians. Worse still, working in town means that the options are even more limited! I think my next venture might be to find some good places to eat in town… watch this space! 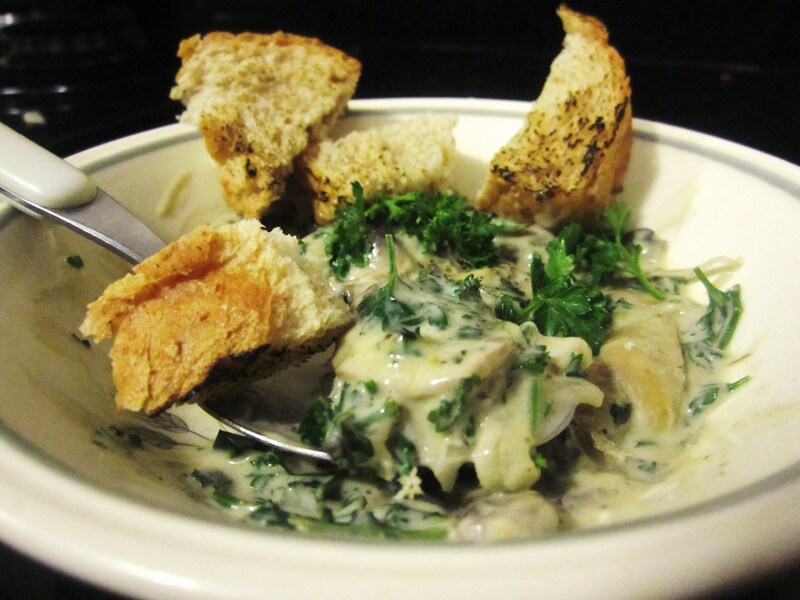 So with that, a craving for creamy mushrooms and a free evening on my hands, I made creamy mushrooms. It’s a recipe I’ve made a few times, after watching too much Jamie Oliver on tv! I’ve made it for every vegetarian that has wandered through my doors, well only one; Miss Y-vo. Speaking of Y-vo…. I am having some serious withdrawal symptoms since she moved to NY! I got all my ingredients together, and found one of my mother’s pans to cook in. she says she’s had it since I was little, and from what I remember it used to be black, and we made chips from it… back before those deep fryer gadgets came about! anyway, like my hubby says, that oldness gives it extra flavour..
mushrooms, I used chestnut, but it would be nice to use wild mushrooms if you can find. 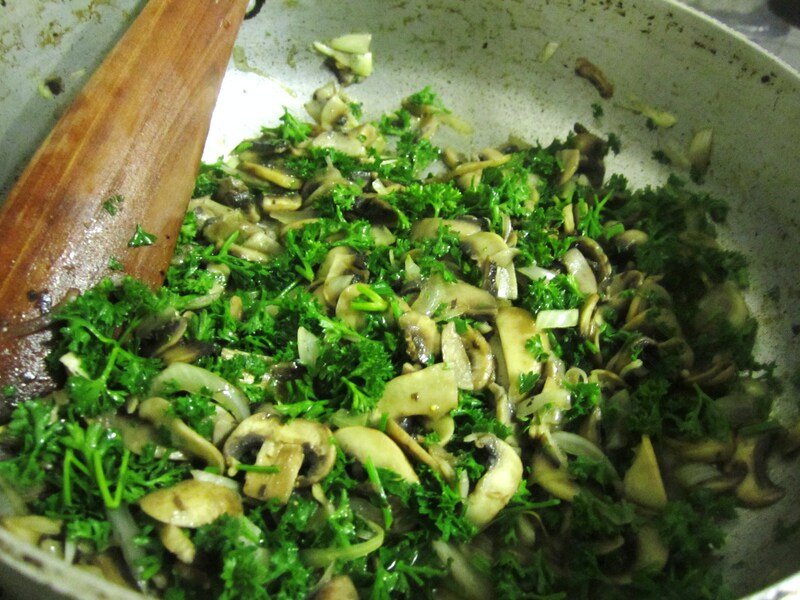 Place the pan over medium heat, add the butter and olive oil, when butter has melted throw in the onions and mushrooms. stir around for about 8 minutes, until mushrooms are brown and onions soft. the smell at this point is intoxicating, nothing smells more fabulous than butter, add anything to butter in a pan and it is bound to smell good! I didn’t add garlic to this, but it is definitely a good idea to add some. 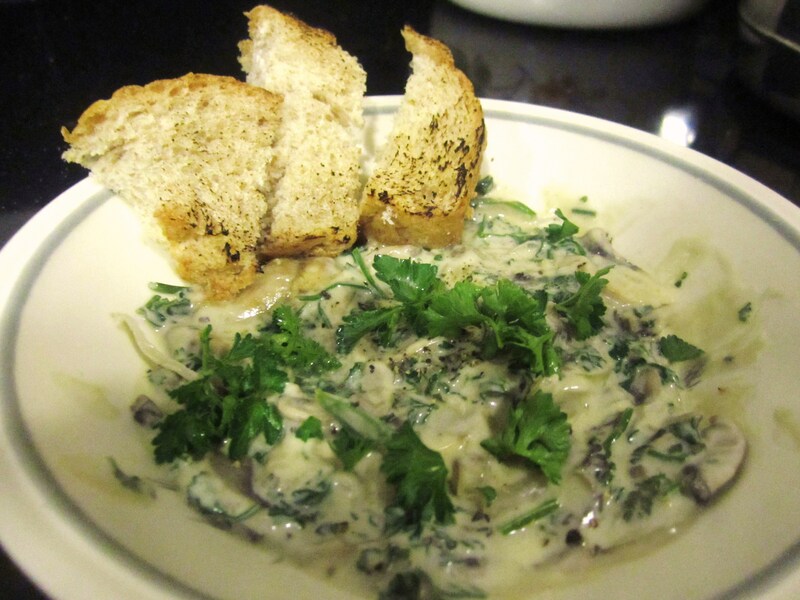 next, add the chopped parsley (take a moment to admire the colours), cream, salt and pepper. let it bubble for a minute, stir around for another minute. take off the heat and squeeze in some lemon, add salt & pepper if you need and a little more lemon. I had this with bits of crusty bread, in the middle of the night, alone in the kitchen, feeling very, very naughty! I don’t know why, but it just felt like I had stolen from the cookie jar… It was that good! But until Easter, I’ll just have to make do with creamy mushrooms and watching others eat their steaks and kuku samas! Enjoy the shrooms, and any one giving up anything for lent, I wish you all the best of luck!